Crabtree & Evelyn's Ultra-Moisturizing Hand Therapy is a cream formulation of shea butter and macadamia nut oil to moisturize and soften your hands. It also contains myrrh, which helps to condition your cuticles and nails. And the intensive conditioning is provided without any greasy residue because it melts instantly into your skin. There are currently 16 fragrances. Crabtree & Evelyn's Ultra-Moisturizing Hand Therapy is my favourite-st hand cream. It smoothens the lines on my hands instantly and plumps them up with moisture. And the scent! Ahhh... I have one residing in every bag that I own, another sitting prettily beside my bed and yet another accompanying me while I work (I bought the massive sampler set 2 Christmases ago!). This week, I acquired the above 2! Haha. Summer Hill has a very light, refreshing floral scent, while English Honey & Peach Blossom is, of course, as sweet as honey! I think it is important to take extra care of our hands because we totally overwork them (More so than the other limbs.). I mean, we use them for practically everything. And besides, hand creams come in really pretty and adorable packaging. 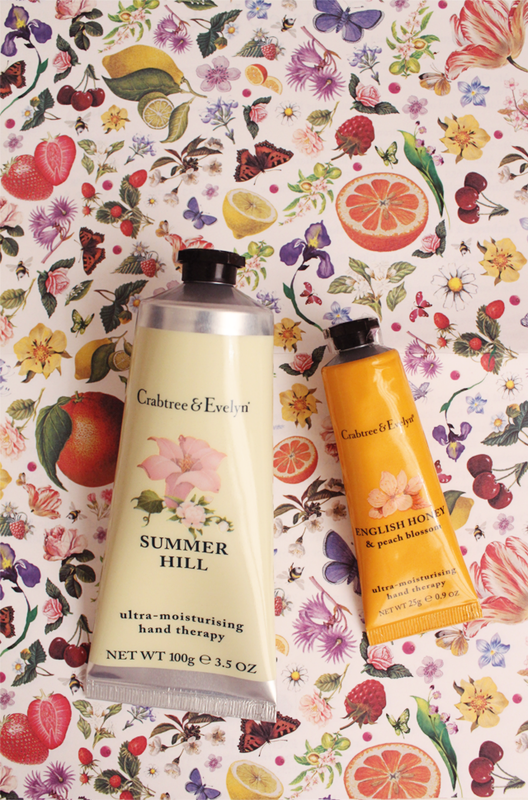 Especially these Crabtree & Evelyn's darlings.